The meal plan is one of the most important aspects to your entire approach towards enhancing your hockey performance. I have been training people for many years and have been in-the-trenches myself for many more years than that, and one thing I can tell you is that this is almost always the reason people fail to get to the level of sport performance that they want. How many people do you know who workout every single week for long periods of time (years even), and still don’t look the way they want to look? I’m betting you know a lot of people like that, potentially even yourself if you’re willing to admit it. This is almost always a nutrition problem. Training is the fun part. It’s easy to get motivated to go train. The execution is simple, do what it says on the paper with a high level of effort applied and you’re out of there. Maybe 60 minutes of your day is consumed, and that’s a wrap. Easy-peasey. Nutrition is what separates those real athletes from the average gym goer. Athletes bodies are built in the kitchen. Think about this for a second, the average workout will last about an hour. This means your 1 hour spent working out is only 4% of your day! The other 96% of your day is completely governed by nutrition and sleep. Where do you think the REAL results are coming from? Where do you think you have the opportunity to get ahead of your competition? Adherence to nutrition is easily the #1 reason why most people fail. Either they eat bad foods and drink alcohol too often, or (and this next one is usually the case), they think they are eating the right foods and taking the right supplements to support their goal when really they are not. 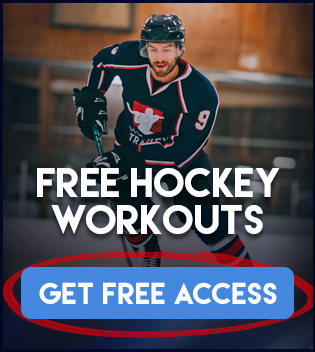 I take the guess work all out of it for you and give you a no-nonsense nutrition approach to get you exactly where you want to be, on the ice making plays and scoring goals. All you have to do is adhere to it and make it fit your schedule. Make sure you check out my muscle building and fat loss blogs on these topics. You have to make things fit your schedule for them to be realistic. Whether you have kids, travel with your job, train in the morning, train during lunch hour at work or school, train at night, have shift work hours, have schoolwork or extracurricular activities, whatever it may be. Your nutrition plan needs to be designed to both be very flexible with timing and also provide world class results. You can create your own in the above blogs, or use some of the meal plan templates I have created over in the Hockey Nutrition Package. This is crucial to have in place before you begin any hockey training program. You need to review your nutrition and meal plan approach and map out how it’s going to work with your schedule. This crucial step can make or break you. This step goes hand-in-hand with step #1. 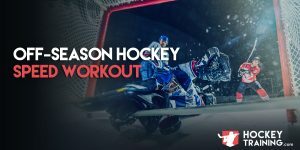 Controlling and optimizing your nutrition can not be mentioned often enough for its importance to your results with any hockey training system. Print off your grocery list and take it with you to the store and have all of your food ready to go each and every week. Whether you purchase in bulk and want to only go shopping once a week, or if you’re somebody who buys only a little at a time because they are buying more fresh then you are frozen then go to the grocery store 2-3 times a week. Whatever your situation demands, print off your list and be prepared. If you fail to plan then you’re planning to fail. You should have all of your food ready to go the day BEFORE you even start your meal plan. This is a habit you want to install into your brain. Repeated acts become habits and habits produce results. If you’re prepared with your groceries each and every week nothing can stop you. This is a habit you need to form to be as successful as possible. Meal plans mean nothing if you don’t have what you need. The idea is to pick a time of day where you know you have time, and do your grocery shopping that day. Do it at this time every single week so it is not sporadic and you don’t run out of anything. For example, you work 9-5pm or have school 8-3pm every Tuesday — and Tuesday is also your off day from the gym, this is a perfect time to get your grocery shopping in. Also, so you don’t forget, keep your grocery list in your car. In this case scenario, you would do your grocery shopping every week on the way home from work or school on Tuesday nights. It’s not rocket science, you have the time. For me personally, Wednesday and Sunday are my grocery days. Make this a part of your lifestyle so you’re not going to the fridge for meal time and seeing it’s empty. You need to create your environment and not allow your environment to downgrade your results. Find your time, and stick to it. Just like you schedule when you’re going to train, you should be scheduling in your meal prep and grocery shopping times. It’s a part of the program as much as anything else is. Just like your grocery list, print these off like clockwork every single week. Preparation is key to changing your physique/performance and any real coach or athlete will tell you that. You can’t just “wing it” and try and keep it on your phone or try and remember your workouts. You will forget something, it’s harder to take notes, and it just ends up in a less effective mess. Trust me, print out your workout sheets from your hockey training program. It will make a huge difference in your training progress. I learned this myself. I print my workout sheets every single Thursday like clockwork. I never miss it. Because I can review my upcoming workouts and prepare for them mentally and physically. Check back with last week’s workouts and see what numbers I should be hitting this week and what numbers I have to hit to beat last week. Also, printing out your worksheets takes no time and no effort, yet gives you a ton of mental and physical benefits. Don’t scrap this one and try to wing it. The best possible scenario is to do what I do, print them all out and keep track of them in a binder. I put all my past and upcoming workout sheets in my binder so I have a detailed log of my training that I can refer to if my progress ever halts, or unexpectedly accelerates. Print out your sheets and get in the gym!